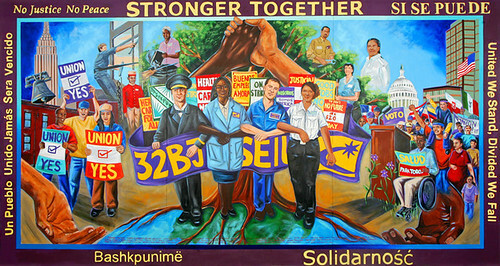 ‘Stronger Together’ was the title of a one day event held at the end of March for people working in the field of Race and Ethnicity in Northern Ireland. The lessons could be applied to almost any sector – any group of people seeking to explore their potential as a network ….. The first aim was seen as a pre-condition for the other two; i.e. it was necessary for people in the sector to connect with each other in order that common purposes could become clearer and the potential for new possibilities be created. The attraction of 130 people to attend this event was both testimony to the hard work of the planning group and to the appetite for such an event. The event was designed using a ‘World Café’ format in the morning to maximise interaction between participants and thus to help identify the common ground and the diversity within the sector and then an ‘Open Space’ format in the afternoon, to enable participants to prioritise the conversations that mattered most to them and from which the potential for follow-on actions could be identified. So much life, a vibrancy and collective wisdom that only becomes possible when people come together in the same room at the same time around live questions of common concern and with a quality of facilitation to help hold the thing together.